High-quality entertainment. The latest edition of Asus' paragon multimedia laptop promises more power in all sectors. The whole thing has only one catch: The buyer has to dig deeper into their pocket. 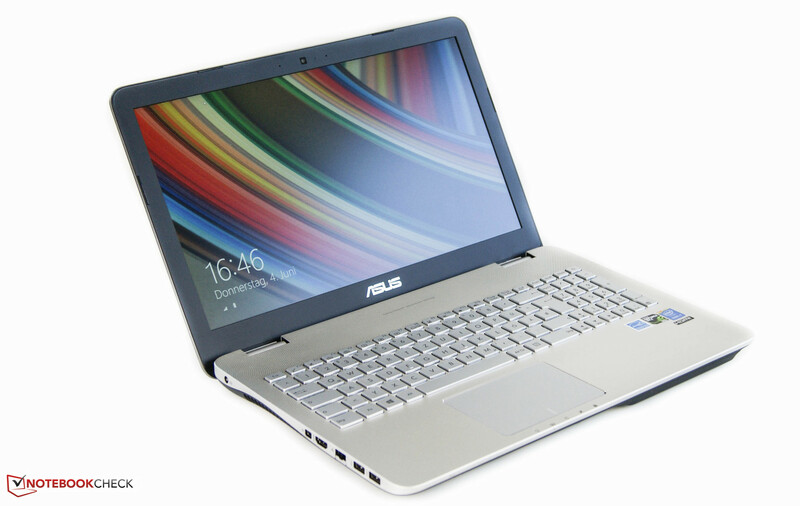 It is not the first time that Asus has presented us with a laptop from its N551 series. We have already put the multimedia system through its paces two times this year, and the all-rounder highly fascinated us. The manufacturer trumps up with a high-performance NVIDIA GeForce GTX 960M and a powerful Intel Core i7 CPU in our current review sample. A Full HD IPS screen, 8 GB of working memory, a 128 GB SSD storage and 1 TB of HDD storage have also found their way into the Asus N551. We use a previously tested model configured with an Intel Core i5 processor and NVIDIA GeForce GTX 850M of this series for comparison. The stronger hardware increases the price by 400 Euros (~$445) to 1400 Euros (~$1556). Since only the "inner values" of our present review sample have been modified, we refer to our existing review of the Asus N551JK for casing-related information and details about the input devices. 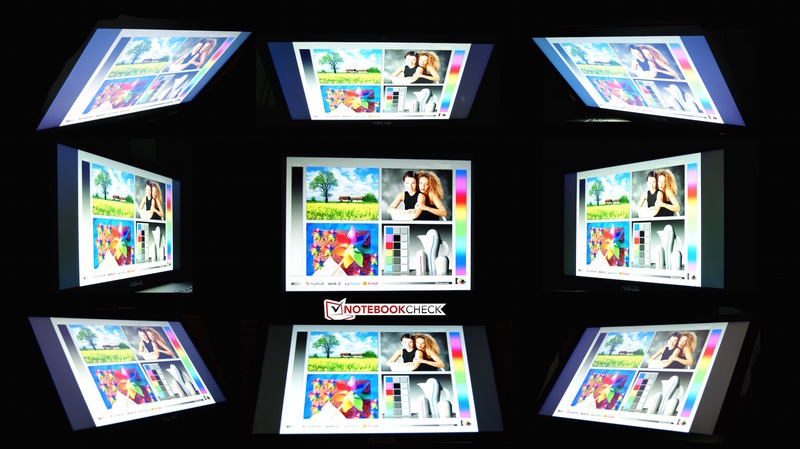 As in the previous model, Asus' N551JW features a Full HD resolution of 1920x1080 pixels. The manufacturer has installed a matte screen from Samsung, and does not offer any screen alternatives. The screen makes a decent impression in brightness. Compared with our previously tested model, the brightness has increased by 25 cd/m² to 338 cd/m², and the contrast of 922:1 alongside the resulting black level of 0.35 cd/m² have also improved slightly. The illumination of 92% is very good, and consequently we did not determine any unpleasant screen bleeding. The maximum brightness is dimmed to 278 cd/m² in mobile use (battery mode). Thanks to the matte screen, unfavorable light sources are not annoying indoors. Outdoor use is also possible, and only direct sunlight should be avoided. Furthermore, an IPS screen is installed that has quite a few advantages in terms of viewing angle stability. Colors and the brightness are not distorted when it is tilted or viewed from the sides. The laptop's generous opening angle also allows using the laptop on the lap without any problems. We determine the DeltaE shift (sRGB) of colors and grayscale levels using our CalMAN analysis. Asus' ex-factory profile exhibits a color shift of 6.22 and grayscale shift of 5:24. These results are middling although an improvement over Asus' N551JK is evident. A visible bluish tint was no longer noticed. However, the complete coverage of the sRGB space and the high coverage of 68% of the AdobeRGB color space thrill us extremely. The majority of the competition from the multimedia category cannot keep up with this. These rates are particularly important for use by professional graphic designers. Asus calls the N551JW a premium class entertainment system. Performance-ready components are installed to power this entertainment system. The combination of a high-performance quad-core processor and dedicated NVIDIA GeForce GTX 960M also enable utilization that goes far beyond the multimedia sector. Up-to-date games should normally achieve smooth frame rates even in high graphic settings. Only the 8 GB working memory has to be criticized because it operates in single-channel mode. However, buyers who are willing to pay more can install a second 8 GB working memory module in the empty slot to enable dual-channel operation. Asus asks around 1400 Euros (~$1556) for the total package. If not much graphic power is needed, then NVIDIA's GeForce GTX 950M should suffice. This configuration costs approximately 200 Euros (~$222) less (N551JX). Intel's Core i7-4720HQ clocks inside our review sample. The CPU comes from Intel's Haswell architecture, and has a base rate of 2.6 GHz. Clock rates of up to 3600 MHz can be reached via the Turbo mode. According to the spec sheet, the TDP is 47 Wh. Not only is the advantage over the tested precursor interesting here. Comparing the results with other laptops that are based on an identical processor is also worthwhile. Our review sample achieved 675 points in the multi-core test of Cinebench R15, twice as many points as the N551JK with its Intel Core i5-4200H. Equally, configured devices, such as MSI's GE60, accomplish the same score. Unfortunately, the Turbo speed was reduced in the course of the test. It started with 3.4 GHz and dropped to 3.1 - 3.3 GHz toward the end. The clock frequency always settled between 3000 and 3300 MHz after running Cinebench R15 in multiple loops. Consequently, the score dropped to approximately 630 points after about ten runs. Concessions in performance also have to be accepted in battery mode. We determined a performance loss of over 40% in Cinebench R11.5. 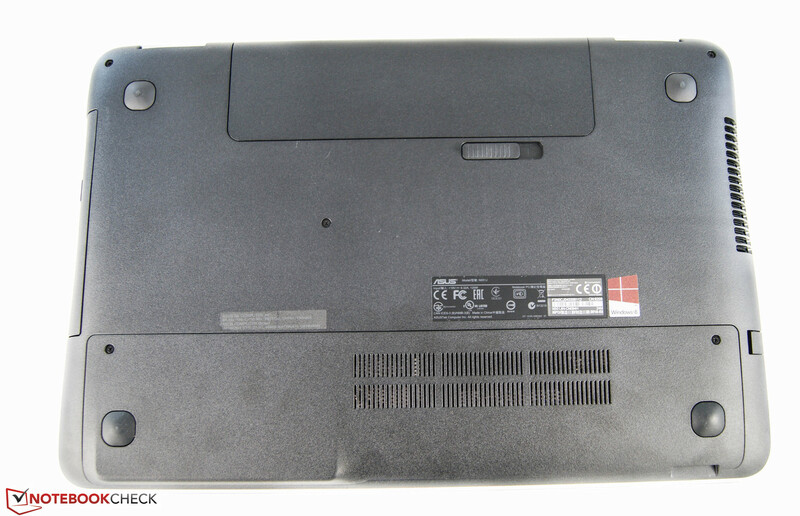 The spec sheet also indicates the high system performance of Asus' multimedia laptop. Seen purely subjectively, our review sample was always highly responsive and did not show any weaknesses, even when running multiple applications simultaneously. PCMark 7 provides concrete figures. 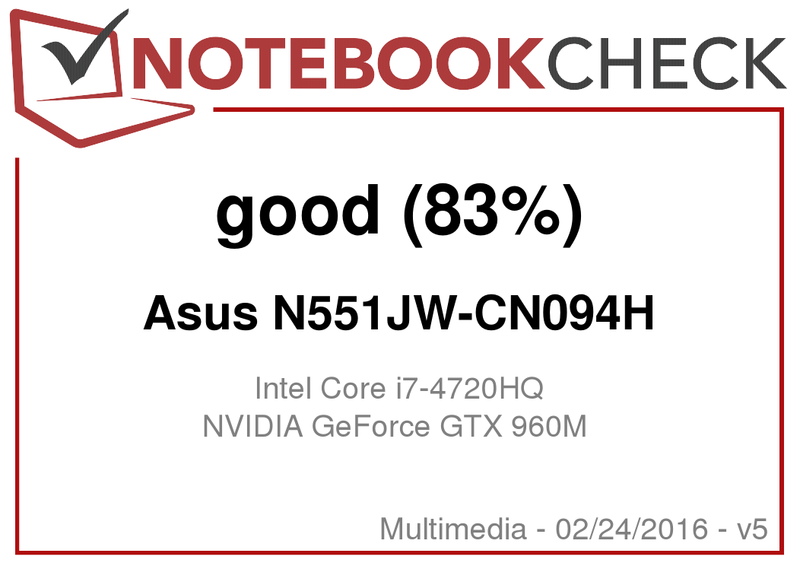 The score is close to the 5000-point mark, which is far in ahead of both Asus' N551JK and our tested MSI GE60. To resolve the compromise between fast and high-capacity storage, the manufacturer has installed two hard drives and separated them into three partitions. The SSD hard drive has been designated as the main partition with a capacity of 128 GB. Since it contains the operating system and all the major programs, it ensures fast workflow. A 1 TB HDD is divided into two partitions with sufficient storage capacity. 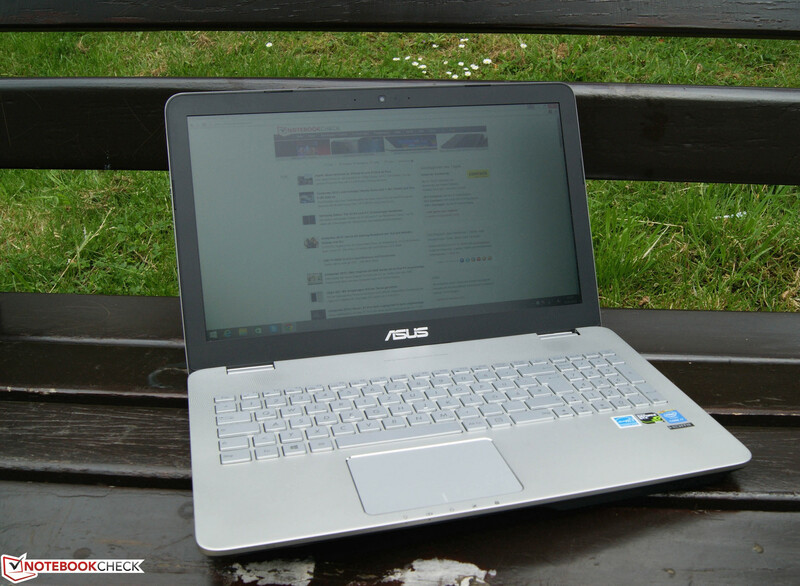 By comparison: The Asus N551JK of our previous test was equipped with an SSHD hard drive. It is particularly important to note that the 4k rates have improved significantly in our current model. The installed SSD manages only a slight advantage in the sequential write rates over our old configuration. The manufacturer has installed the model of NVIDIA's GeForce GTX 960M with the highest possible memory configuration of 4 GB. 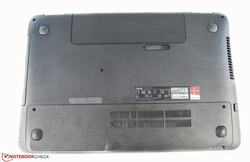 Other laptops, such as Schenker's XMG A505, often only have a 2 GB video memory. In terms of performance, NVIDIA's GTX 960M supposedly has an edge of approximately 10% over the former NVIDIA's GTX 860M. 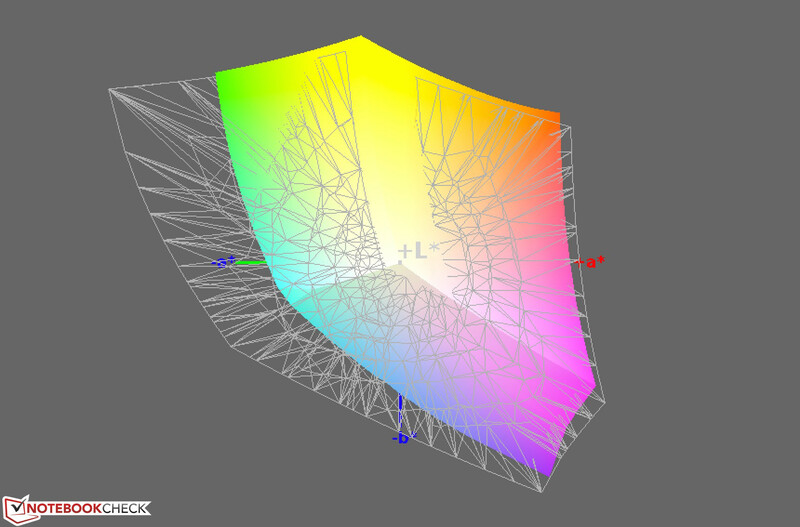 We use the program 3DMark 11 to determine the performance of the installed graphics unit. With over 5300 points, the review sample accomplishes 1000 points more than our previously tested model, which was configured with a weaker NVIDIA GTX 850M. However, it achieves 300 points less than an equally configured Schenker XMG A505. Performance losses will have to be expected in battery mode (mobile use). According to 3DMark 11, only 2126 points are then achieved. We want to find out whether we should expect more power and by how much with NVIDIA's GeForce GTX 960M based on a gaming benchmark. We opted for the same game that we used in the test of Asus' N551JK: "Thief" from 2014. The stronger graphics unit just allows smooth reproduction in maximum settings. The weaker precursor model of our Asus N551JW achieved almost 30% less frames per second. As we found out in the course of our test, the 15.6-inch multimedia device has plenty of power. We will now dedicate ourselves to the noise development of the fans and HDD. 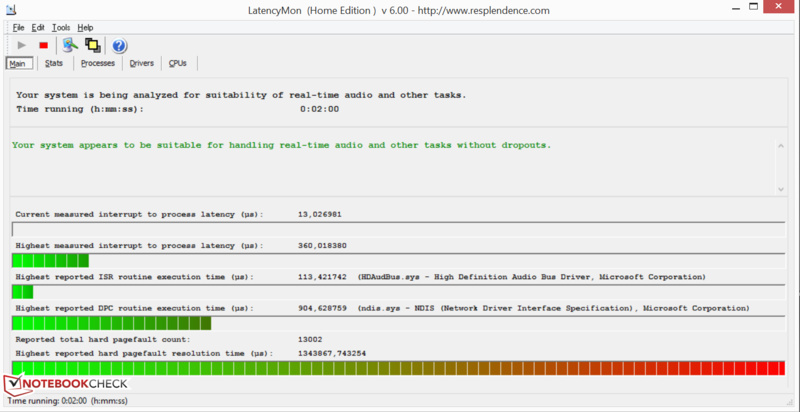 Our review sample was exemplary in idle mode, and it did not produce any distracting noises above 41.2 dB(A) in load. We recorded a maximum noise of 44.7 dB(A) in the stress test. The only point of criticism is the occasional high-pitched hum of our review sample, which is only really audible in very quiet surroundings. 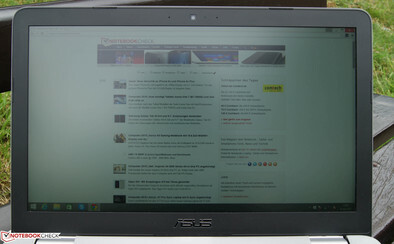 Asus' N551JW cannot be called exceptionally slim. The larger volume ensures a noticeably better heat dissipation than in slimmer laptops from the competition. Even during sustained load utilization the surface temperatures did not exceed 40 °C (~104 °F). For example, Acer's Aspire V 15 Nitro gets disconcertingly warm with a hot spot of nearly 50 °C (~122 °F). We have to note that the power supply reaches temperatures of up to 53.8 °C (~129 °F) during load. Thus, the user should make sure that it is never hidden under covers or pillows. We used the programs Prime95 and FurMark to find out how the review sample behaved in stress situations. The CPU's clock frequency dropped to just 800 MHz during initiation. One to two cores still calculated with 3400 MHz. Only after some time did the multimedia device from Asus recover, and the clock rate was close to the average base rate. 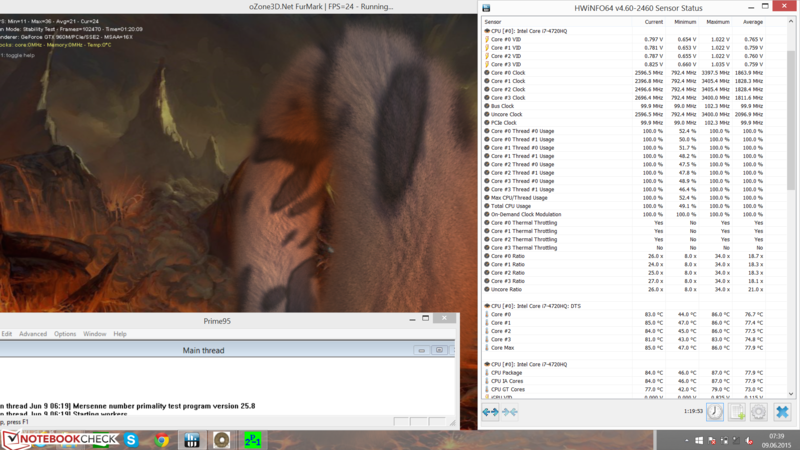 We restarted 3DMark 11 after finishing both programs. Fortunately, it scored 5285 points, which is equivalent to after a cold start. Despite the power guzzling components, Asus' N551JW consumes less in idle than its precursor. However, the high-performance hardware should be noticed during load, shouldn't it? - Not at all. With a maximum power consumption of 96 watts, it consumes approximately 4 watts less than Asus' N551JK. However, caution is recommended in view of the observed throttling in the stress test. As in the former model, Asus installs a 6-cell battery with a capacity of 56 Wh. It will be interesting to find out whether the runtime is now longer since the discussed power consumption is lower compared with the older model. We simulate Internet browsing at a brightness of 150 cd/m² in a real-life scenario. The device shut down after only 4 hours and 6 minutes, which is exactly one hour more than its precursor. Asus is true to its principles and presents us with a successful and elegant multimedia laptop. As usual, the workmanship is satisfactory. The device could only be slightly slimmer for our taste. The input devices are even suitable for prolonged office work but the trackpad makes a spongy impression. By comparison: We did not observe this drawback in our former test of the differently configured Asus. With a price tag of 1400 Euros (~$1556), it costs far more than the 1000 Euros (~$1111) of the former model. However, we receive more power in all sectors - starting with the Intel Core i7 processor that proved noticeably faster. The manufacturer has also upgraded the graphics performance, and even enthusiastic gamers will be happy with this multimedia device. Last but not least, a fast SSD storage device is installed that was not present before. The higher performance does not lead to mobility restrictions in terms of battery life. Instead, one hour more is possible with 4 hours in real-world use. Overall, Asus' N551JW is a recommendable and powerful multimedia laptop. However, taking a look at the competitors from Acer or other cheaper configurations of the N551 could be considered if the price is too high.